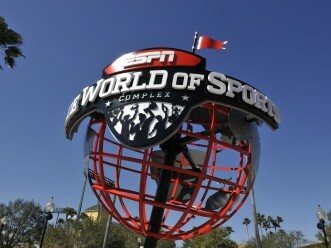 Eight teams are scheduled to square off this Thanksgiving weekend at HP Field House at the ESPN Wide World of Sports Complex at Disney. The eighth annual Old Spice Classic, a premier Division-I men’s basketball tournament, features a strong field of eight, including No. 5 Oklahoma State (4-0) and No. 21 Memphis (2-1), in addition to Purdue (5-0), Butler (4-0), Washington State (2-2), Siena(2-4), LSU (3-1) and St. Joseph’s (2-1). The action begins on Thanksgiving Day at noon, with four games scheduled for the opening day of the tournament. Games continue on Friday, with the first buzzer set for 11:00 a.m. The tournament concludes on Sunday, Dec. 1, with the championship game slated for 7:30 p.m.
All games will be broadcast on the ESPN network. Please see the schedule below for a complete listing of air times. Tickets are still available for purchase through Ticketmaster, at ticketmaster.com or by calling (407)-745-3000, and are also available at the ESPN Wide World of Sports Box Office. Media interested in applying for credentials should contact Charley Green at cgreen@breakaway-sports.com.